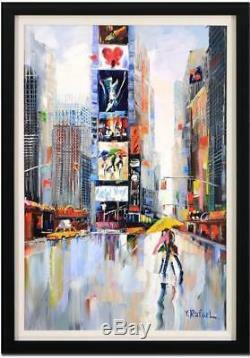 "LOVE IN NEW YORK" by YANA RAFAEL is an Original Acrylic Painting on Canvas. The artwork is magnificently framed. Image dimensions are 36" x 24". Framed dimensions are: 40.5" x 28.5". His amazing Original Yana Rafael is listed with the Submit Best Offer option. This piece was painted by Rafael in 2018. Submit Best Offer: The item up for sale is a very rare Yana Rafael Original ACRYLIC PAINTING. It is one of the nicest Rafael Original Paintings we have ever offered for sale. This is truly a spectacular piece.... This Original Acrylic Painting looks absolutely spectacular in person. Rafaels style is full of vibrant colors and expresses emotions typically associated with bold life. When violent colors are next to each other they trick the eye into a sensation of movement. Yana uses a thick application of paint, distinctive brushstrokes and real-life subject matter to emphasize geometric forms, to distort form for expressive effect, and to use unnatural or arbitrary color. Yana paints with a sense of urgency, using the paint straight from the tube in thick, graphic brush strokes. Her choice of color varies with her moods and occasionally she deliberately restricts her palette to only a few colors. Perhaps this very technique is what draws one into the painting: the fulfillment of seeing all angles of the spectrum of life and in turn reaching a deeper understanding of how all living things are tied together. Painting, to me, is a unique experience. Each work is a surprise and has its own personal and intuitive meaning. My paintings evolve organically from life's everyday glances. Each layer determines and guides the next. The favorite technique of the artist is referred to as impasto a way of applying paint, specifically a thick, textured application of paint where the marks made by the brush or painting knife stay visible. The impasto style is evident in the work of Vincent van Gogh, who clearly is a defining influence of this young and upcoming Ukrainian artist. Firerock Fine Art is the Southwest's Premiere destination for Fine Art. At Firerock Fine Art, we sincerely value our relationship with our collectors, and guarantee you will be 100% satisfied with any of your art acquisitions. We stand behind the quality and authenticity of our artwork, and strive to make our customers happy for a lifetime. We look forward to the opportunity to meet your fine art needs for many years to come! Sue Sedlak Gallery Founder Greg Sedlak Fine Art Director. Our goal is to respond to your inquiry in 24 hours or less. Get images that make Supersized seem small. Tailor your auctions with Auctiva's. The item "YANA RAFAEL LOVE IN NEW YORK FRAMED ORIGINAL ACRYLIC ON CANVAS RETAIL $4800 MINT" is in sale since Sunday, April 1, 2018. This item is in the category "Art\Paintings". The seller is "firerockfineart" and is located in Fountain Hills, Arizona.